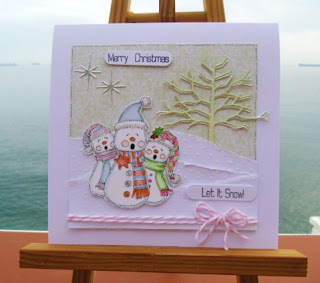 Your card is so adorable...love how you have created a scene! Welcome to Forever Friends...so glad you have joined us! Long time no speak! Just popping by to say hi!Hope you are well - glad to read that your weather is nice still - we had snow yesterday, but luckily most of it has gone today!!! Tilly has recently had a lump removed from her paw - luckily all results came back fine.... and at last I can start taking her out for walks again (albeit still on the lead)!! Anyway love this card you've made super sweet. Take care and catch up again soon. another fab card Sylvie ! Lovely card Sylvie, I'm so jealous of you having good weather, it's freezing here. Good grief...boy do I feel silly! Sorry about the mix-up with my earlier comment.... I am following you now, so I can keep better track! Enjoy your weekend! Wonderful card, love that stickers!! !